• Categorized under Disease,Health | Difference between scleritis and episcleritis. To understand the difference between the sclera and the episclera we should first known the minor difference in their anatomical location in the eye. Sclera is considered the deepest layer out of the protective layers covering the eyeball. Sclera is also known as the white of the eye. Episclera is a thin membrane covering over the sclera. “Epi” means outer and hence episclera means it is the thin covering present covering the sclera. 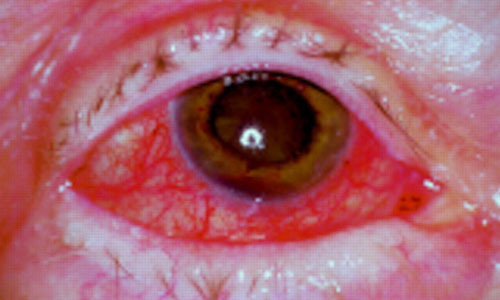 Inflammation of the sclera is called as scleritis whereas inflammation of the episclera is called as episcleritis. Episcleritis resembles localized conjunctivitis of the eye whereas scleritis is more often a very serious disorder which is accompanied by a systemic disease. The most common underlying disorder for scleritis or episcleritis is rheumatic arthritis. Other systemic diseases which are associated along with the above eye conditions are scleroderma, systemic lupus erythematosis and inflammatory bowel disease. Scleritis can also occur in cases when the herpes zoster virus involves the eye. The symptoms do not differ much but the symptoms of scleritis are more dangerous and harmful than scleritis. Eyeball tenderness is commonly seen in scleritis along with keratitis, retinal vasculitis and in extreme cases there may be retinal detachment also. Piercing boring pain of the eye is characteristic of scleritis. Sharp pain in the eye along with dull aching in the eye and the eye ball is commonly seen in episcleritis. Increased sensitivity of the eye to light also called as photosensitivity is seen in both the conditions. Blurred vision and bland watering of the eye is seen due to inflammation of the tissues. A Red patch which may be slightly raised is commonly noted in cases of scleritis. There might be a gritty sensation in the eye as if due to a dust particle with constant irritation experienced by patients in episcleritis. There is no way one can prevent these diseases apart from cleanliness of the eye. The inflammation can only be reduced by application of local eye drops which have anti-inflammatory content in it. To have an accurate diagnosis of the scleritis one must visit the oplthalmologist who will assess the eye thoroughly. Underlying diseases if any should be ruled out by the doctor. On slit lamp examination of the sclera, there is a criss cross pattern of the blood vessels which are tortuous. Scleritis presents a characteristic violet hue along with sclera edema and dilatation. Blood tests like Complete Blood Count(CBC), ESR, CRP, RA factor along with ultra-sonography of the eye ball are recommended for scleritis. Treatment for scleritis has to be more vigilant as if it is un-attended it may lead to perforation of the sclera. Surgery may be required for scleritis if there is perforation due to negligence of the disease. Steroid based eye drops along with medications for systemic diseases will have a greater effect in controlling the scleritis. Immunosuppressive drugs may be prescribed if there is no control of scleritis for a longer duration of time. Episcleritis is a much milder disease and hence only local anti-inflammatory eye drops will cure the uncomfortable feeling in the eyes. Scleritis is inflammation of the sclera and is more often associated with redness of the eye with or without loss of vision. Episcleritis is the inflammation of the covering of the sclera and more often seen as plain redness along with watering of the eyes. It is not as dangerous for the vision and the eye as scleritis is. rachita. "Difference between scleritis and episcleritis.." DifferenceBetween.net. November 17, 2014 < http://www.differencebetween.net/science/health/difference-between-scleritis-and-episcleritis/ >. I am scheduled for spinal surgery July 7th. I woke up this morning and think I have scleritis of my right eye, I’ve had it before in the same eye. This is Sunday so have to wait till morning to see my ophthalmologist. Is this going to prevent my surgery,(steroids)?